Flameworked glass small sculptures such as vases and sea creatures plus earrings, pendants and necklaces. Creative succulent gardens in planters made of recycled timber, new glass and terracotta. Functional and artistic kiln formed glass individually designed and made by Dagmar Ackerman. Fashion designs by Idle Wild. 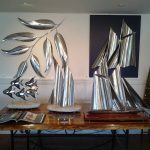 Inspired by his life surrounded by the bush and the ocean, John creates bespoke sculptures of unparalleled craftsmanship using rare, iconic Australian timbers, stainless steel & Sydney sandstone. 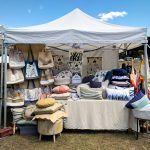 littlecrow design creates cushions, wall-hangings, bags and napery from beautiful fabrics using original screen-printed designs. LouiseM Studio is a ceramics studio based in Marrickville. Vases, cups, plates, bowls and more. Each piece is handmade with individual touches, no two pieces are ever exactly the same. Lucinda Clutterbuck (Smith) is an artist working in trans media and installations using humour rebellion and compassion. Mikmat Designs creates contemporary laser cut jewellery. My Lovely Pets Design create custom pet artworks. 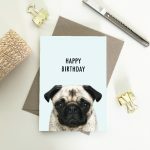 They have a selection of prints and greeting cards, featuring pets. 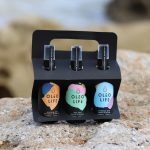 Oleu Life is an urban apothecary brand that creates easy-to-use products made with 100% pure essential oils to help people find balance and wellbeing in their everyday lives, through the therapeutical benefits of the oils. Handmade men’s jewellery and unisex jewellery in titanium and stainless steel. Rain Forest Terrariums – a complete self sufficient ecosystem. In a closed environment the natural water cycle and photosynthesis keep the forest alive. A great way to have nature inside your place, office, etc. Hand made wood turning from mainly Australian timbers. Includes bowls, platters, bottle stoppers, cufflinks, boxes and sculptural pieces. Hand woven scarves, knitted and crocheted afghans, hats and beanies, slippers and toys. 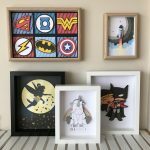 Handmade 3D Popout shadow box art from various supplies such as paper, feathers, wool/yarn, leaves etc. 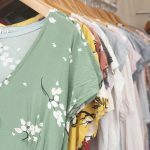 A boutique designer featuring clothing for the sophisticated creative. Kiln Fired and Slumped Glassware including functional and sculptural pieces. 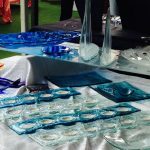 Bowls, platters, cheese plates, candle holders, glass sailing boats and more. Bespoke, handmade leatherwork and eco-printed garments. Fold Formations Sustainable Jewellery by Kirsty Gorman. 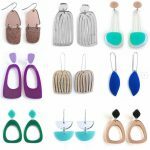 Unique jewellery capturing the breathtaking beauty of the natural world, handmade from 100% recycled and sustainable metals. Make going zero waste fun! Hand screen-printed and handmade cutlery wraps and handkerchiefs printed with eco-friendly, vegan ink and cotton tote bags with screen printed applique. Stunning handmade jewellery using Swarovski Crystals and semi precious stones sourced from around Australia and the world. Jennifer Newton is a local Australian artist creating original ceramic pieces for exhibition and sale. Her work is designed to be both decorative and practical in the home. Handmade mermaid cloth dolls and mermaid inspired girls wear. Handmade jewellry and accessories reminiscent of tropical drinks or futuristic moments in nature. 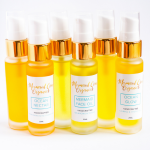 Natural skincare products made in small-batches in Sydney. Eco Resin jewellery designed and handmade by Hiromi Tatarakis. Peg and Charlie make a range of baby accessories including; Dribble Bibs, Teething Rings, Burp Cloths, Toy Hammers, Rattles, Wee Wee Tee Pees, Silicone Teethers, Gift Packs and more. 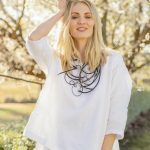 All items are handmade in Australia. Red Sky At Night is a jewellery label inspired by a fascination for mystic relics and archaic artefacts from eons past. Innovative, handcrafted and powerful jewellery. Original sterling silver jewellery, no two pieces are the same. Shiztastic is a textiles & print based label by artist & designer Katy Dee. 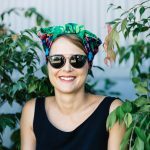 This collection of scarves, accessories and homewares are statements of colour that show a lust for life, bring a smile to your face and fun to your heart and home. Jewellery inspired by all things natural made from 100% recycled sterling silver. Each piece is completely unique.